I’m not sure what the difference is, but you are definitely correct about the drum samples (per key). I found loading samples to be somewhat annoying, but they’re definitely fun to play with once on the Z! Step effects on glitchy samples, drum breaks, etc! How are people finding the synth engines after a while? Amazing, serviceable or they get old? Is using samples effortless? 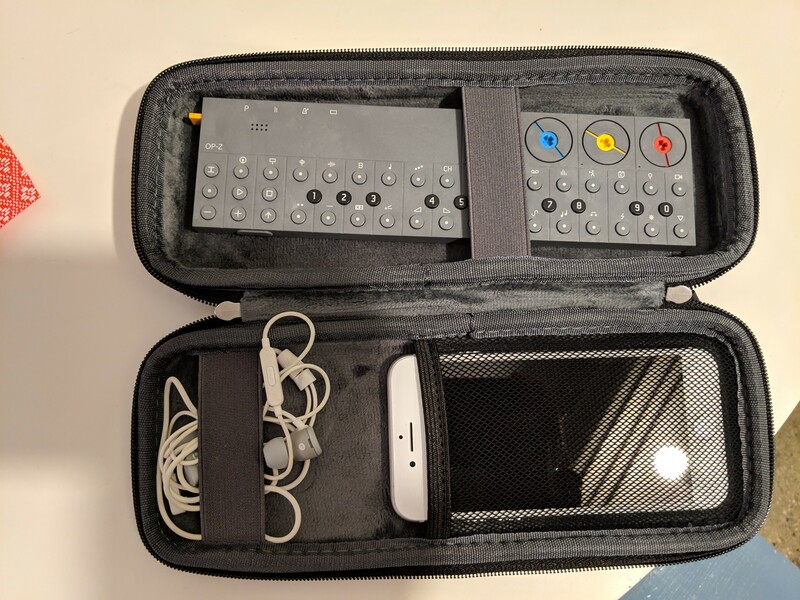 I guess the sequencer is pretty much what sells people on this device, but I’d very much like it to be a rewarding groovebox in and of itself… Would love to hear how people like it as one. I find the synth engines serviceable. They aren’t super deep (ala Electribe), but there’s enough variance between them so that they don’t get too old. Probably won’t be doing crazy sound design with them, but it’s not quite just presets either. Having the filters per synth engine as opposed to being an effect really helps. I’ve found adding samples isn’t too hard. Just takes a little time. Still holding out hope that they will add sampling to the Z, but a part of me realizes that may never happen. One thing that I’d like to see, is the ability to change the types of each track. Like if I don’t want to use the arp track, but would rather have another lead or bass track or something. For the time being, I sunk my money into OTO fx, maybe I’ll revisit this later. It does seem like a very fun little tool. Yes thanks @doublecoolbossman and @rbeny! Happy to hear more OP-Z opinions and experiences from anyone willing to share. There is a drum utility made by Steve Duda that is available for free download that should help with the formatting. Not sure if you’re aware of it here ! the synth engine is decent to good imo, the ability to randomize the presets then saving them really helps finding good sounds. I’ll echo this sentiment on the synth sounds. Definitely not insane, but if pressed I’d say they are good. I think there’s some really sweet spots. With all that I agree with @rbeny. I find myself really wanting more of certain track types. If I could make every track a chord track I’d probably buy a second. It does look like there is space available for any further effects that will be developed by TE. But the reverb is a little different than the spring. Ive had my op-z for a day and a half now and I am loving it. Although the synths do have macros, not a full range of parameters, with the filter and lfo section you can get some great sounds. The filters resonance is pretty nice! Although there are fewer parameters to tweak within the engine the parameter locking can let you get some complex step to step changes! In that sense, the op-z is super accessible. I feel like sometimes within a DAW I have some interesting ideas about panning, reverb, and filter to direct an instrument around in 3D space within my mix, but it takes a long time to automate these parameters. Everything is at my fingertips with the op-z I love it! I guess step sequencing is a much better fit for my playing style. The punch in effects are really fun to experiment with, as well are the step components. Haven’t messed around with the tape yet, although I think it seems more playable than the tape effects on the op-1! Very happy with this little unit so far. Edit: Forgot to mention I learned the Op-Z purely from reading the manual and watching a video or two! Totally doable with out the screen. I think the track types are a quiet way of pulling the reigns on the processor. I’ve had tracks start dropping notes on full/busy 8 track compositions. If every track was a chord track with decent note release times the Z probably wouldnt keep up. Hi, anyone have experience importing their own sounds? Here’s a good tool for converting to the sampler format. Before I found this I was creating the aif file in audacity then loading into op-1 and saving again there to make it compatible with the op-z. Otherwise the samples would not load. Not sure why it was this way as the drum tracks I did not have to do any extra steps with. The op-1 drum utility will work fine for drum samples. have had an OP-Z for a month now and really, really love it. Perfect for subway bleeps and bloops. Check out my mobile sound setup! The OPZ lab module is out. Still trying to figure out seq. drums with OPZ through Anisble to control drum modules. Wouldn’t the USB-C to USB-A midi work here? 4 pairs of CV/TR mapped in simple MONO pitch/gate outputs responding to MIDI channels 1-4. TR mapped to notes C4, D4, E4, F4 (60,62,64,65). Enter learning mode by holding Key 1 and pressing preset (all CV/TR will clear). As unique notes and/or CC messages are received they are mapped to the next available CV/TR output respectively. Once all outputs are mapped all LEDs will go out. Press Key 1 (panic) to cancel learning. seems like you could with multi mode get 4 channels of gates/triggers and CV? Assign them to the 4 drum tracks on the OP-Z. That would be hot. Just lost at how to get that going through OPZ menus. also if you have a wall of modules, its hardly portable, why do you need a palm size controller. To setup the OPZ for this, you’ll have to connect it to a computer and modify a config file to change channel numbers. I no longer have my OPZ, but I briefly experimented with this, and found that Ansible and/or the OPZ would mix up the incoming sequences (ie whatever was happening on channel four would interrupt channels 1,2, and 3). I got a loud high pitched sound from the audio out of the OPZ as well. Thinking back, it may have been from plugging it into ansible directly. I imagine the OPZ tries to pull power from ansible over USB, so I wonder if an external power solution like Offworld etc would work better.